When Simeon, a mountain lion shifter meets Asher, a blood demon, there is instant attraction. But, how can they act on the way they feel when there is an entire kingdom at stake. Asherkan Iblis is a blood demon, a slave to elves and a soldier. He keeps the fact he has royal elvish blood a secret. His half brother returns to broker peace but reveals he is actually there for much more and Asher faces a decision that could lead to his death. 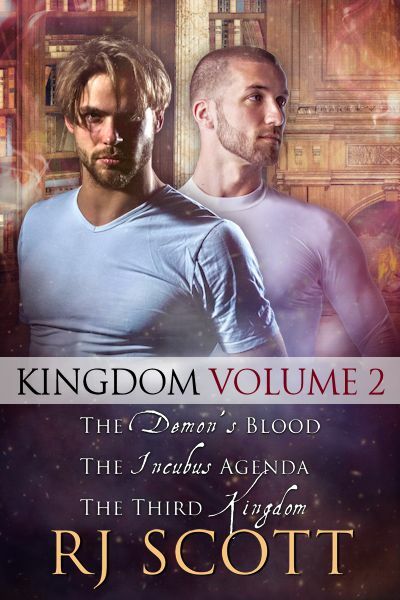 Simeon Blue, brother of the leader of the Feline Guild, mountain lion shifter, is tasked to accompany Phin on a mission over the Red Mountains and into the Second Kingdom. He has to talk to the Guild but all they want to do is stay in isolation and his mission is fraught with danger. When Simeon is wounded Asher hides him and suddenly, next to a kings death, a cousin's hate, and Ludvik's black magic, love falls on the agenda. When Nicholas Tarrant sees a broken and bloody Brody Lennox dragged into the Werewolf Coalition he has to decide. Stay under cover or help the incubus live. His decision is simple. Nicholas Tarrant has worked hard for his position on the Werewolf Coalition. Having access to whatever is happening inside the Coalition is important to the Underground and he's good at blending in. Brody Lennox is sent to Glitnir to broker talks of peace but is dragged broken and bloody into the Council chambers. Ludvik wants him killed as a traitor. Can Nicholas save Brody? Or is Brody too broken to be saved? The story that began as a simple Retriever case, has become the tale of the fight against a thousand years of evil. The wolf shifters have Niceros to take down. The Vampire Twins have to deal with Cassius. The Second Kingdom is in disarray and Simeon, Asher and Phin are desperate to calm the unrest. An alpha needs to accept his role, a blood demon has to become the King he was meant to be, and the Vampire twins have to end the war. Against all this, Reuben and Ethan, lovers separated for a millennium, are thrown back in to a war to end the poison that is Ludvik Peitrol. In a battle on the barren fields of Arberfan is where this story will end. How can love survive the evil that is another's hate?